Trichuris vulpis, the principal whipworm in dogs (rare in cats), is principally found in the eastern United States. These parasites live in the large intestine (colon) and may cause inflammation, bleeding, and intestinal protein loss. 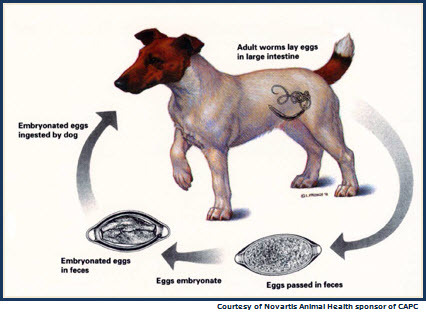 The life cycle of the whipworm begins with ingestion of embryonated eggs. The ova hatch in the small intestine and the larvae burrow into the mucosa (this does not cause any clinical signs). The young adults emerge after about a 1 week period and relocate to the cecum/colon where they deeply embed the thread-like head (the "whip") into the mucosa to feed on blood and tissue fluids. Trichuriasis, or whipworm infection, is preventable and treatable. Monthly deworming is the safest method of action. Many products are available for your dog or cat.